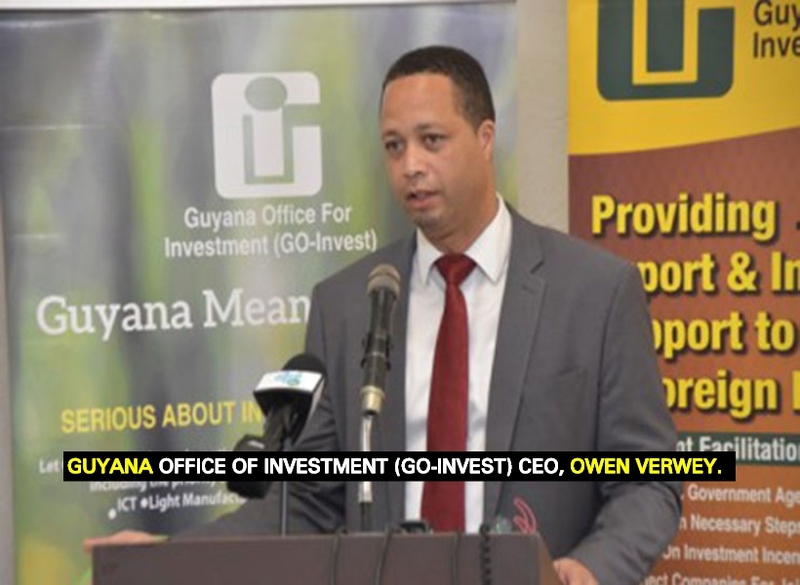 The activities of the Guyana Office for Investment (GO-lnvest) in 2018 generated investments worth a total of $89.4 Billion last year. This was revealed to members of the media today by Chief Executive Officer of Go-Invest, Owen Verwey. Speaking at the agency’s first press conference for the year, held at Duke Lodge in Kingston, Verwey said that the investments were for all sectors of Guyana’s economy. The CEO said he was proud of the work accomplished last year and the Agency will endeavour to build investors’ confidence and promote development opportunities that bring lasting benefits to all Guyanese. Verwey said that these investments are expected to create 1,644 jobs when the projects are fully operational. He said that these new jobs and associated training opportunities will amplify Guyana’s human resource capabilities across key sectors including Agriculture, Light Manufacturing, Tourism, Services, Forestry, and Energy. Further to this, Verwey said that the $89B was had from 56 executed investments, 38 of which were local, I5 being Foreign Direct Investments (FDIs), and three joint ventures. Verwey said that the FDI agreements were predominantly within the Agriculture, Services and Manufacturing sectors, along with one in the Information and Communication Technology sector. The Go-Invest CEO stated that among FDI projects were the manufacturing of pre-cast concrete construction materials, coco peat from coconut shells, ventures in transshipment and aviation as well as business process outsourcing services (call centre) sector. He said, too, that joint venture agreements which were executed were in the Energy, Tourism and Manufacturing sectors. According to investors’ projections, Verwey said that the value of FDI projects totaled $11.3B while joint ventures totaled $2.3 B. He noted that the said figures also reveal that the value of local investments in 2018 was $38.5 Billion, primarily in the Agriculture, Energy and Light Manufacturing sector. These projects he said are projected to create at least 1,056 jobs when fully operational. To complement these activities, Verwey said that GO-Invest completed a robust programme of inward and outward missions that year to explore mutually beneficial investment opportunities and implement trade-related activities aimed at obtaining new markets and increasing exports.